Several months ago I posted all about cleaning frames, removing the dark old comb so I could add fresh new wax foundation. 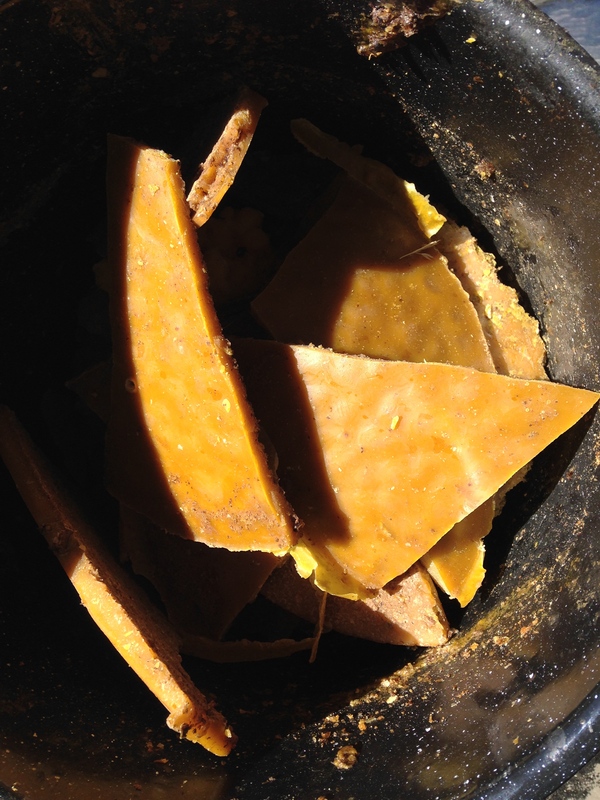 Of course, beneath all that old black crustiness is bee-utiful, golden beeswax that can bee used to make skin products, soaps, lip balms, furniture polish (yep), candles, and more. So how do we get rid of the bad to get to the good stuff? That’s what I’m going to show you in this post. First you’ll need some dedicated wax processing equipment. Half gallon cardboard milk carton with top arched section cut off. I’ve never collected a ton of old comb at one time. It’s something I collect over time. When I have a bucket full, then I’ll melt it down. But first you’ll want to clean your comb and cappings thoroughly so you don’t end up with sticky wax. You don’t want honey in your wax. 1. 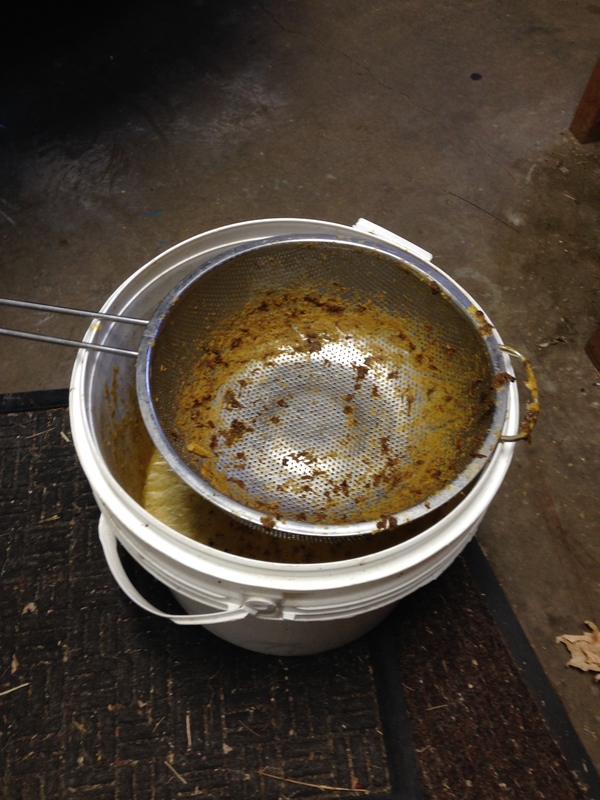 Place the comb and/or cappings in a 5 gallon bucket. 2. Fill the bucket with warm water. Warm enough to melt the honey but not the wax. 3. Dig in with your hands and stir the wax around so all the comb makes contact with the warm water. 5. Refill the bucket with more warm water and repeat the process multiple times until the water runs clear. 1. 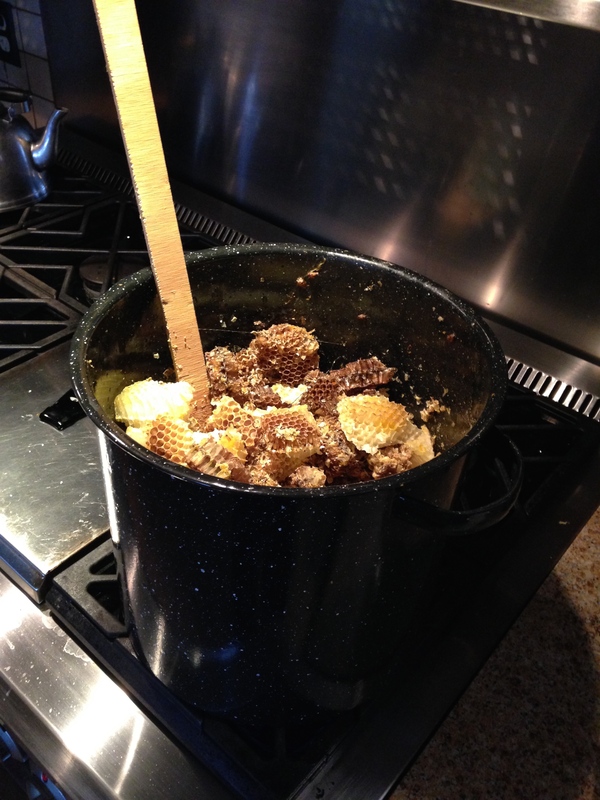 Fill your pot with the clean comb and add about 2 inches of water to the bottom of the pot. 2. Turn the heat on medium and watch the pot! 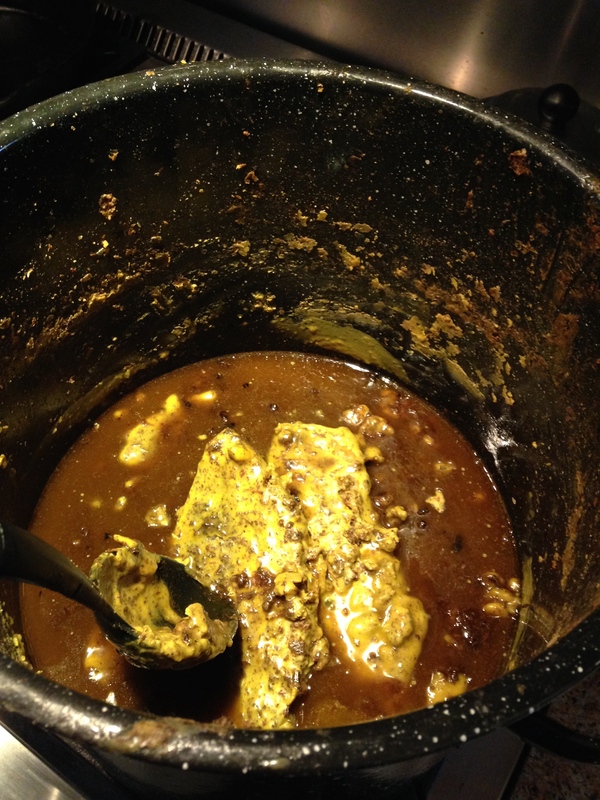 Do not walk away from the pot – this stuff can boil over and cause a horrible mess and it’s dangerous. 3. 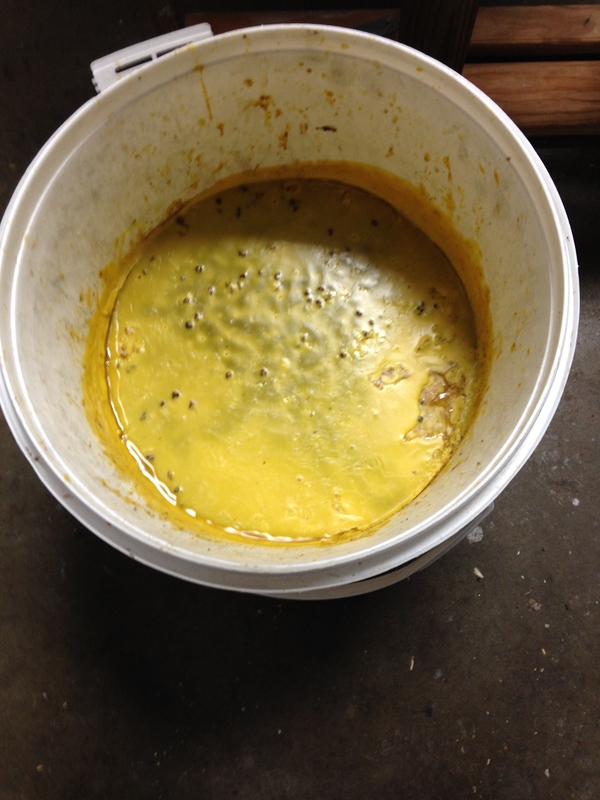 Gradually the wax will melt down and you will have a yummy brood and larvae wax stew. Stir constantly with the wooden spoon. 4. Once everything is melted down completely, place the colander over the bucket and pour the hot pot o’ wax stew through the colander and into the bucket. I do this in the garage. 5. 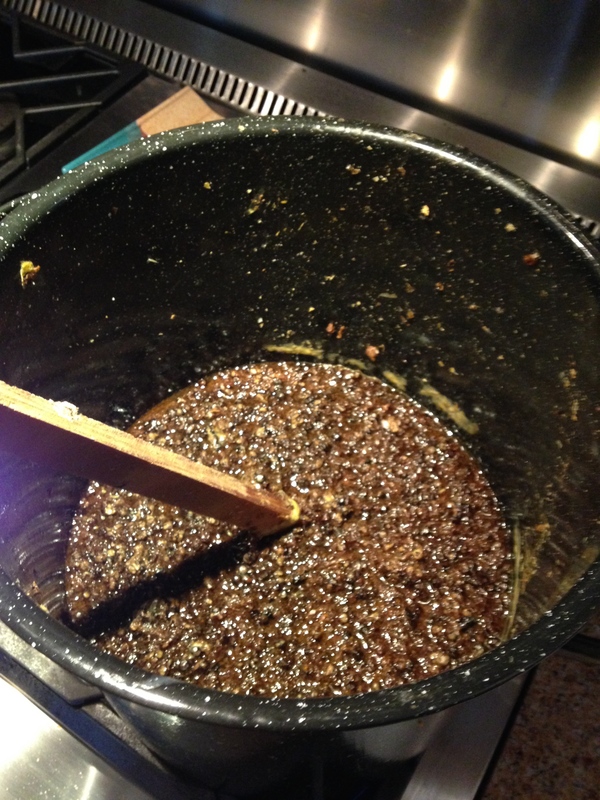 Use the wooden spoon to stir the lumpy leftovers in the colander to help release all the wax down into the bucket. 6. Dump the colander filled with lump leftovers in the chicken coop or in a back corner of the yard where the wild critters can snack on it. 7. 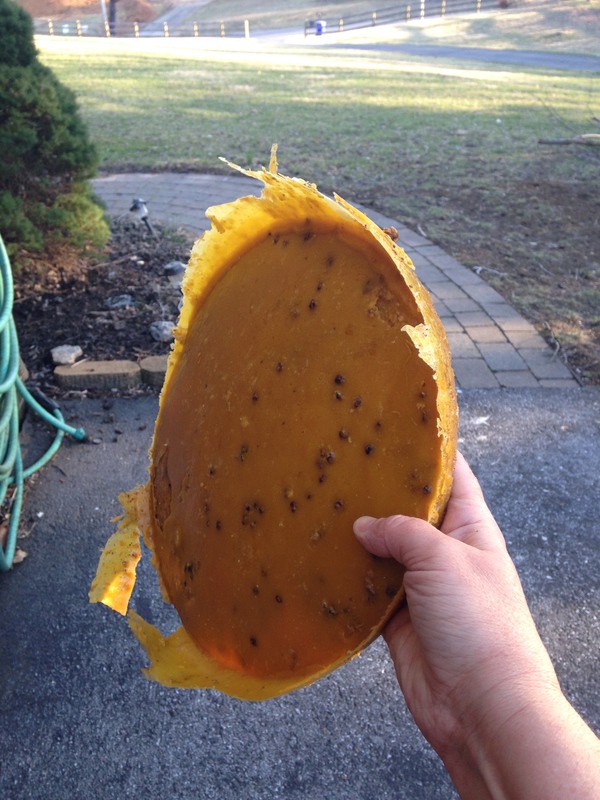 Allow to cool overnight, then fish your first wax cake out of the bucket and scrape off and discard the loose, dirty layer on the bottom. Well done! 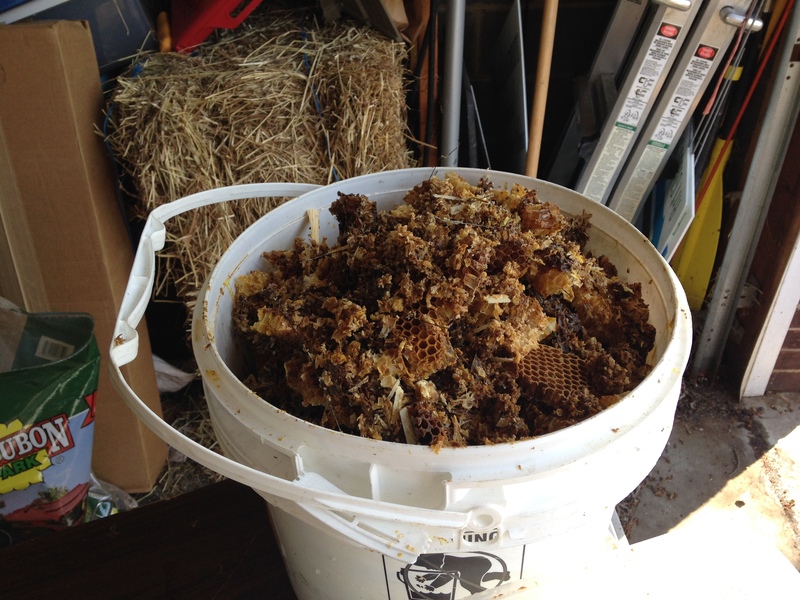 Collect 4 or 5 more buckets of comb and repeat this entire process for each bucket full so you end up with 3 or 4 wax cakes. (The wax cakes preserve well in the freezer until you’ve collected enough for Part 3). 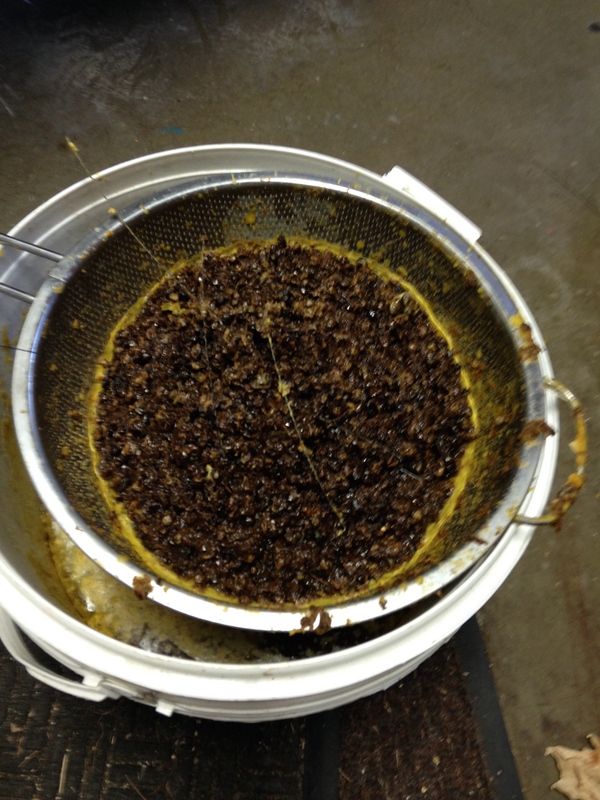 Your wax cakes, at this stage, a still filled with dirt and bee chunks. So we’re continuing to melt and clean our wax. We start this step once we’ve collected at least 3 wax cakes. If you have more than 3 wax cakes, then one milk carton may not hold all of the liquid wax, so bee prepared if you have more wax. 1. Break the thin cakes into chunks and add them to your pot. 2. Fill the pot about 2 inches with water. 3. Turn the heat to medium and watch the pot! 4. Stir with the wooden spoon until all is melted completely. 5. Place colander over the bucket, then dump the wax stew through the colander and into the bucket. 6. 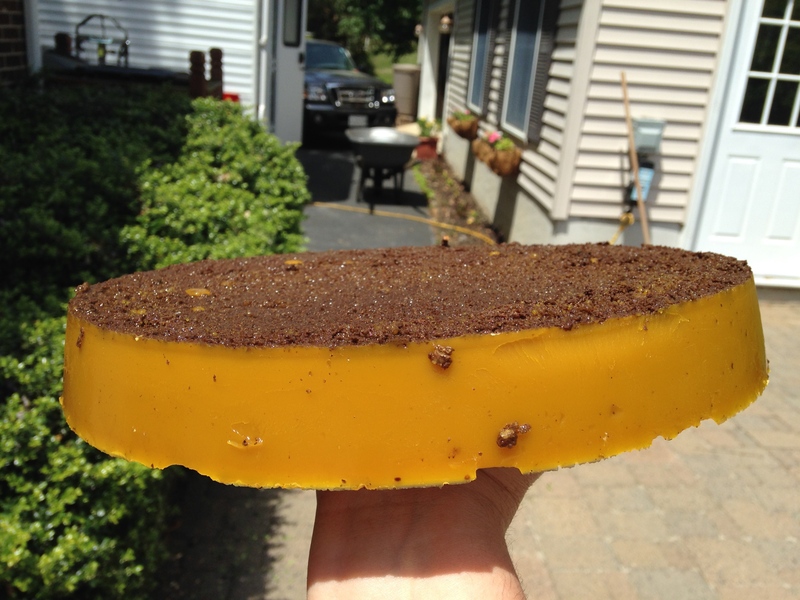 Allow to cool overnight and in the morning, fish out your large wax cake. 7. Scrape off the bottom layer of dirt. Now at this point you should have an impressive, much cleaner single fat cake of wax. You can repeat this process again, or move on to Part 4 for the last cleaning phase, depending on how dirty the wax still appears. I use an old crockpot for this phase. You could also use a double boiler over the stovetop. 1. Start by cutting a 12″x12″ double layer of cheesecloth. 2. Cut the top arched section off of a cardboard milk carton. Leave the container as tall as possible. 3. Cover the top of the carton evenly with the cheese cloth and securely slide the rubber band over the cheesecloth to tightly secure it around and over the top of the milk carton. You don’t want it to fall in when you pour the hot wax through it. 4. Cut or break the wax cake into small enough pieces so it fits into the crockpot or double boiler. 5. Turn on low and allow it to melt completely. The crockpot can be left unwatched. 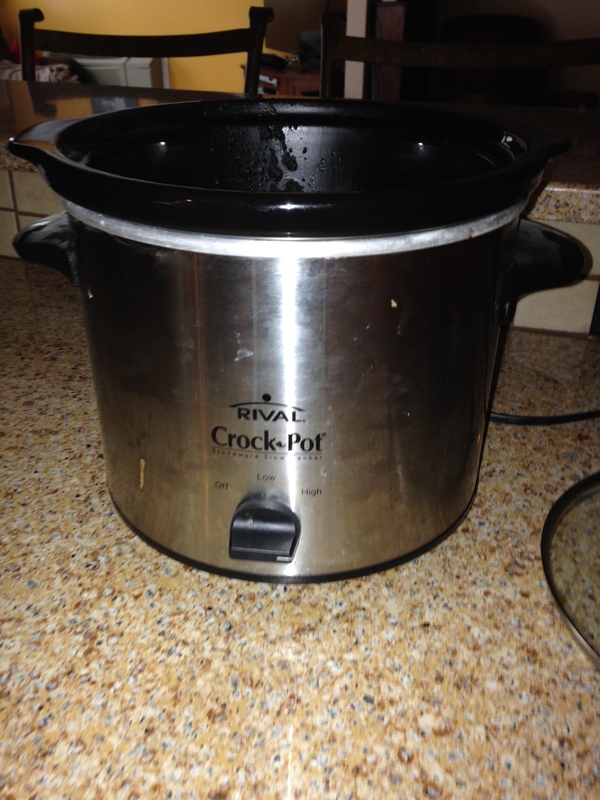 The same is not true for the double boiler, so keep an eye on it so the water and wax don’t boil over. 6. 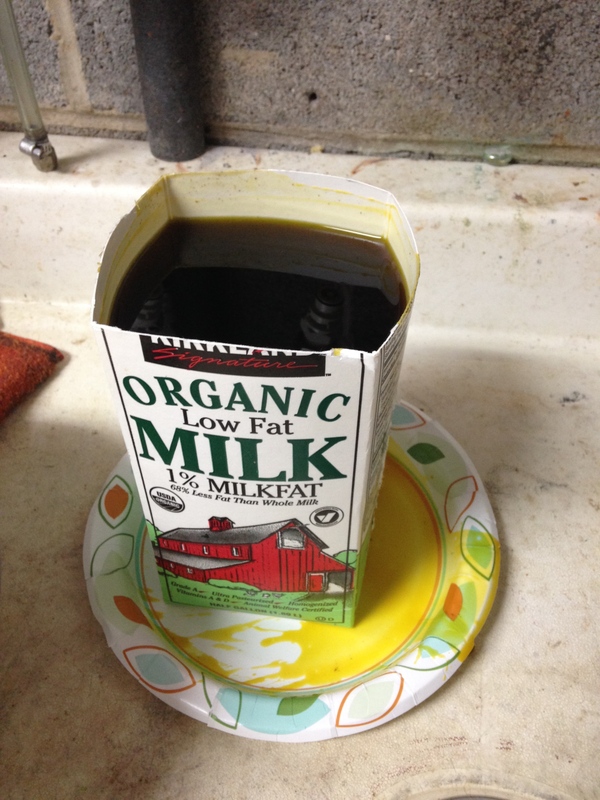 Pour and strain the melted wax through the cheesecloth and into the milk carton. 7. 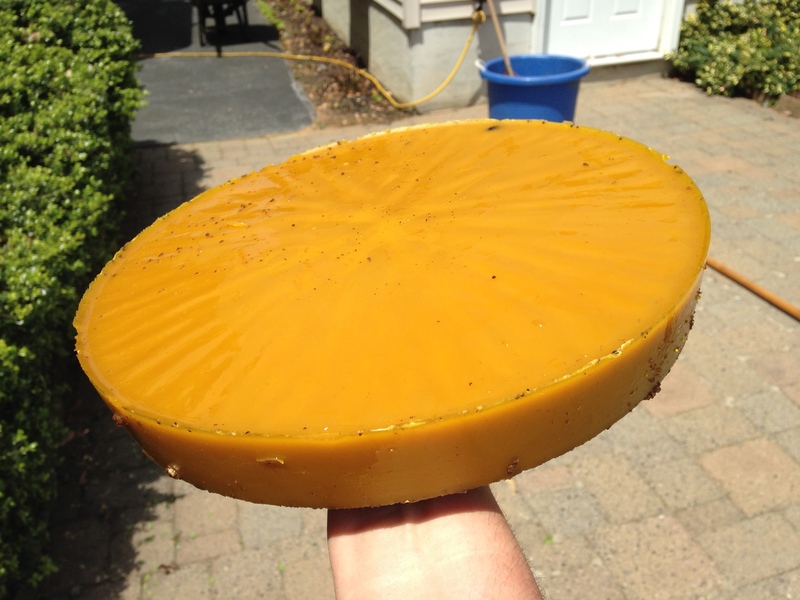 Remove the cheesecloth and rubber and and carefully set aside the wax filled carton and let it cool overnight. 8. Peel off the cardboard and you should have a bee-utiful block of wax that can be carved or shredded for all kinds of fabulous natural products. Note: if you want smaller bricks, then purchase a silicone mini loaf mold and pour the wax into that after it’s been strained. I’m hoping to post more tutorials on making product of the hive, so stay tuned. Happy beekeeping! ← Yellow Hive is Back!